One of the tasks I accomplished last week on the greenhouse garden shed was to complete most of the siding on the backside. It was a complicated task due to many little cuts and some creative problem solving that was involved. One of the issues was with the "secret door." I wanted the backdoor where my mower will enter the shed portion to look like a single normal door. To do that I needed to disguise the right door as much as possible with the siding. Unfortunately I had to leave a 2 inch gap between the door siding and the wall siding to allow the door to open as far as I wanted. I covered the joint gap with pond liner (that's the black line on the right) to form an airtight gasket and tucked the edges of the liner underneath the siding. When I get around to painting the siding I'll try and paint the pond liner to make it blend better. Underneath the left windows there is one spot that needs patched up with siding. I had a piece of siding perfectly cut for that spot but when drilling a starter hole (advisable when you are afraid to break something) the piece snapped, effectively making it 6 inches shorter! The siding is almost complete and should only need one more workday to cover the gables and some small areas on each side. 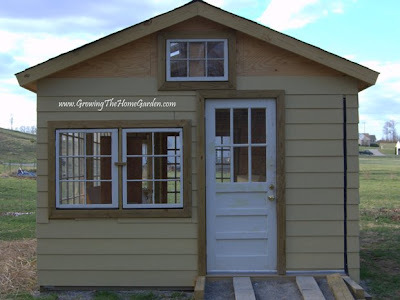 I would share some of the other updates that happened over the weekend with the shed but it's raining while I'm writing this and I don't have any pictures yet. I'll just save them for another post! I am very impressed. When yours is finished maybe you will come over and build one for me :) I like your wide door idea for the mower.